Ms. Celiac Says...: Bring Out The Cake! 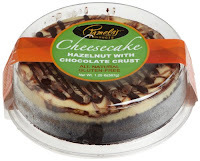 One of my favorite gluten free companies, Pamela's Products, has come out with a line of cheesecakes and cakes. These gluten free cakes are perfect to serve at your holiday dinner! As of now, Pamela's Products Gluten Free Cheesecakes and Cakes are only available in a few select stores in Michigan, New Mexico, and California. However, you can order them at Ms. Celiac's Market! For more information, please visit their website at www.pamelasproducts.com.